For the past two years I have entered into the US Golden Demons. Sadly this year they are no more but that won't stop me from competing. Having already started on my entry before I learned of the cancellation it's off to the Crystal Brushes with my Tomb King. This model technically started all the way back in 2012. 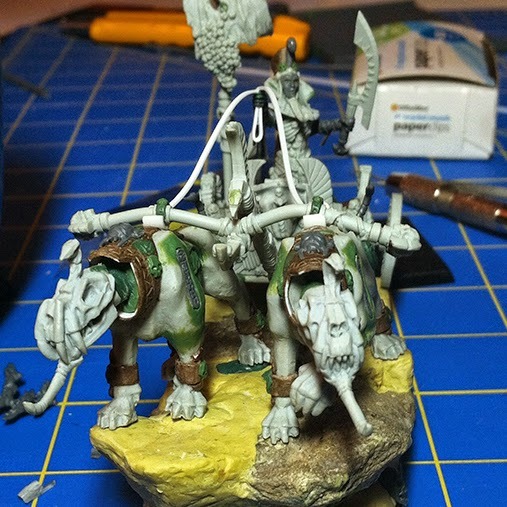 I had just started collecting Tomb Kings and came up with the idea of a chariot pulled by constructs after I saw someone do something similar by just using the High Elf lions. The idea really stuck with me, but I wanted to make mine even more in the style of Khemri. 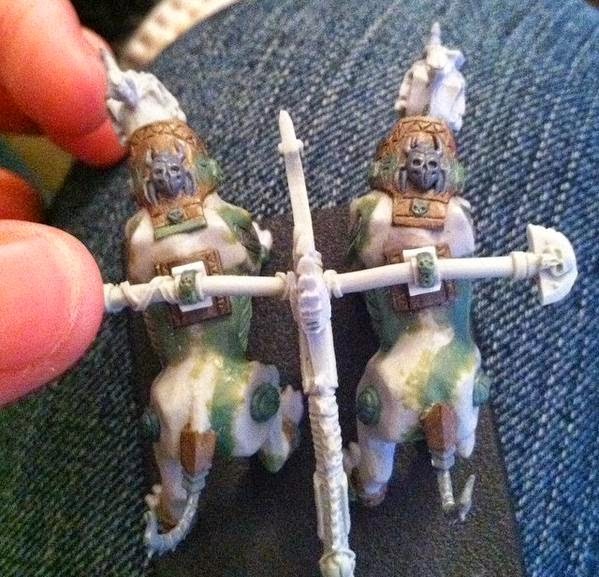 After searching around on the GW site for awhile I came across the Ogre Sabertusk models. They were perfect for my base model. I put an order in for them at my local hobby store, but sadly the order took several months to come in and I ended up painting the Savage Orc warboss for that year's Demons. I have been sitting on those Sabretusks ever since and when it came time for me to pick an idea for 2014 I decided to give it a go. I got ahold of the heads from the Screaming Skull Catapults to use for the constructs. Luckily they were the perfect size. 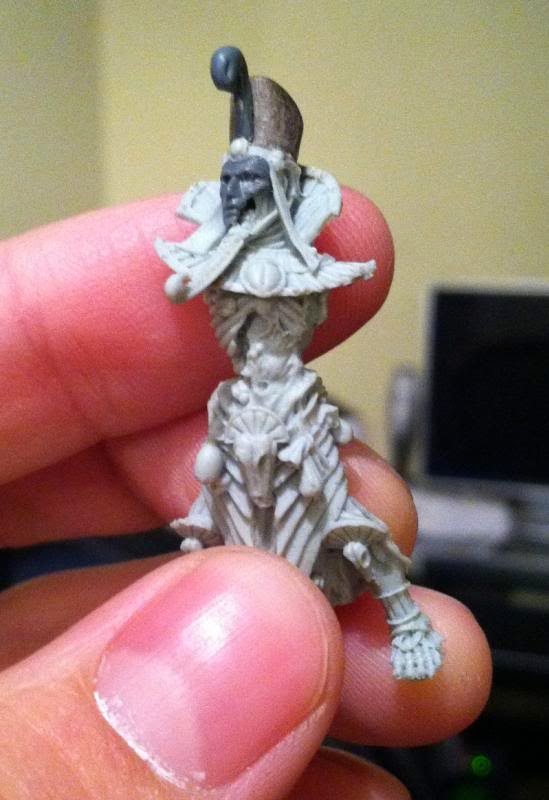 Using the Warsphinx as a guide I started by swapping out the head. I copied the rib pattern on the sides and added the cowl, cuffs and scarab decorations. 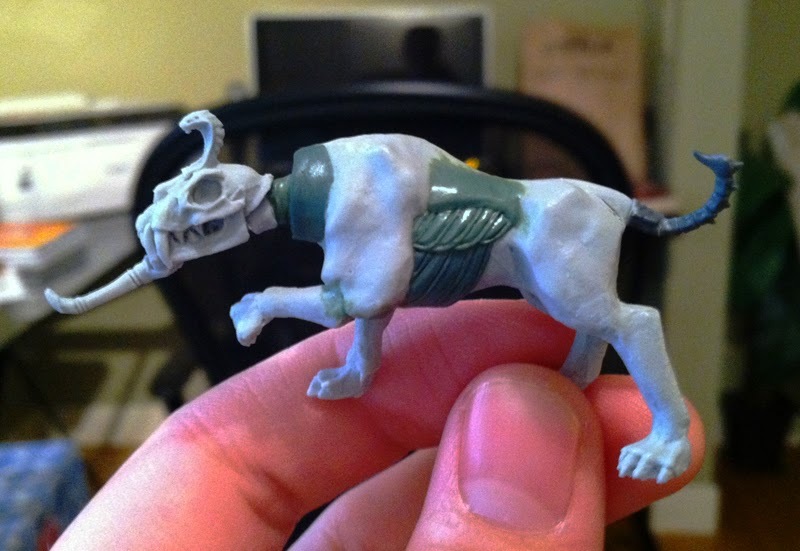 This is also the project that taught me how to sculpt skull icons. There are a ton on the constructs. When it came time for the tail I used the scorpions that come with the Warsphinx kit. Again I was really lucky with how well they matched up size wise. The last thing I added to them were the hieroglyphs in their shoulders. The actual hieroglyp piece comes from the Tomb Guard shields, which I carefully cut out. I used a dremmel to make the niche for them. It was actually fairly easy. The hardest part was making the hieroglyph piece thinner to fit. 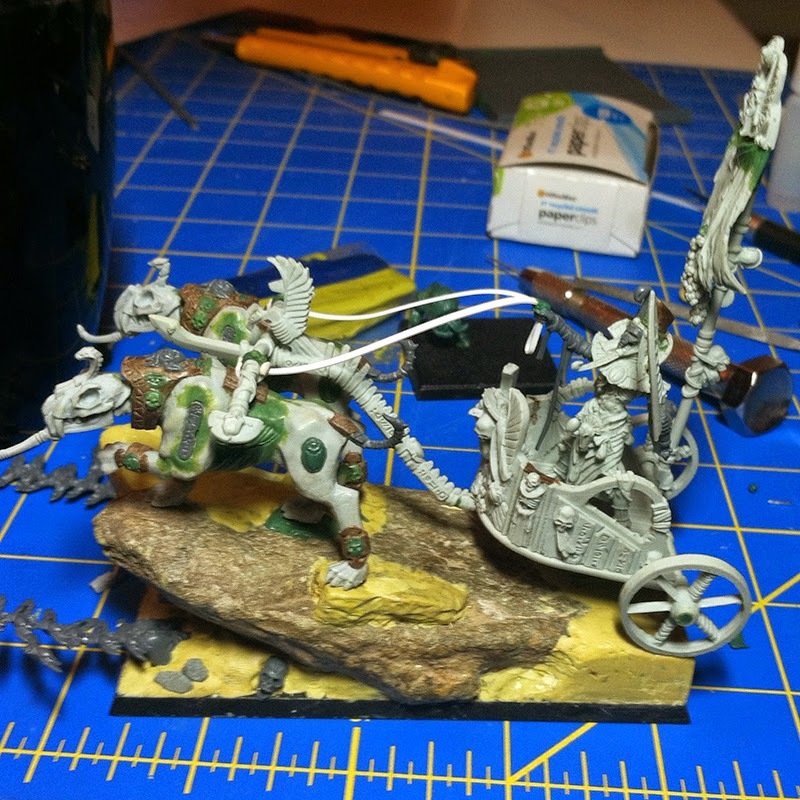 With the constructs done for the moment I moved onto the chariot and King. There was only one choice on what model I would use, Settra of course. 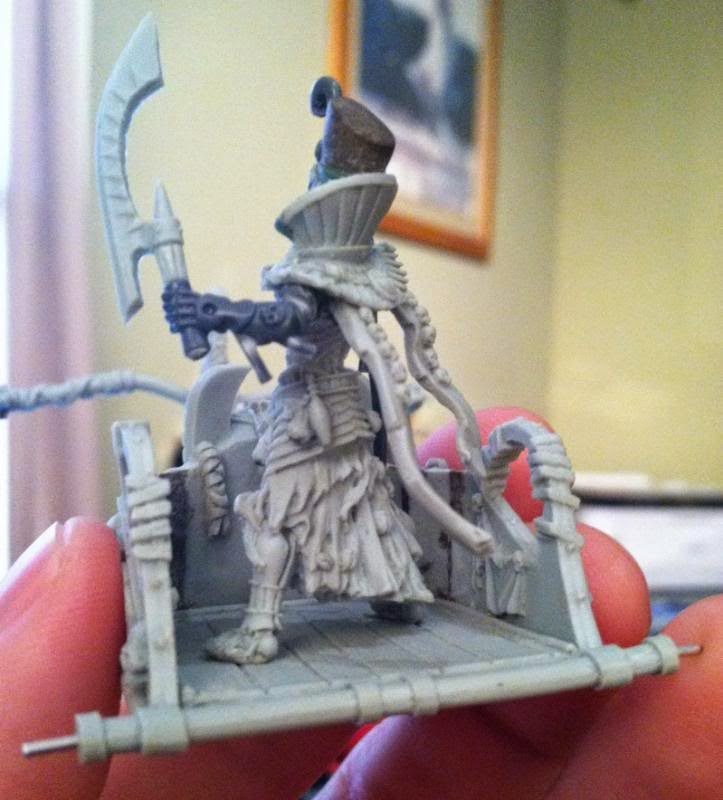 The chariot itself isn't really converted at all. I only had to shorten the yoke a bit to accommodate the constructs instead of horses. The king had his hat cut off and a new one sculpted. I mostly did this to distance him from Settra in looks. His new hat was based off actual Egyptian crowns with the snake bit coming from the Necropolis Knights banner top. The hardest thing for me to do was to cut his face off. I love the Settra sculpt and think it has a ton of character to it, but I knew I wanted a death mask. The mask itself came from the Tomb Guard box and had a chunk cracked off the bottom so I could still see parts of Settra's face through it. 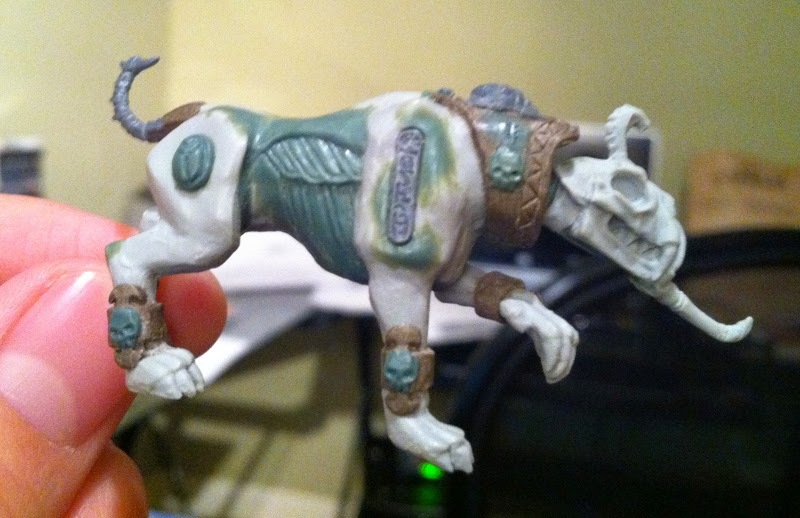 The arms come from the plastic Tomb King that comes with the Warsphinx, the sword from Settra and the reins are plasticard. His cape is actually the banner the chariot model. Now that left me without a banner, enter Settra's actual cape. 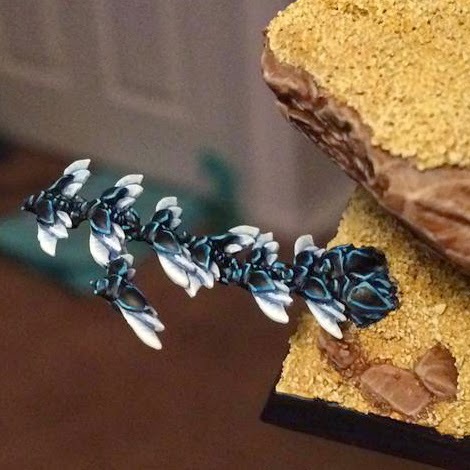 I really like the look of the scarabs crawling all over it and since it has a larger blank space it gives me more room for free hand. The base is made from a rock I picked up in Cinque Terra, Italy. Lots of slate laying around there. 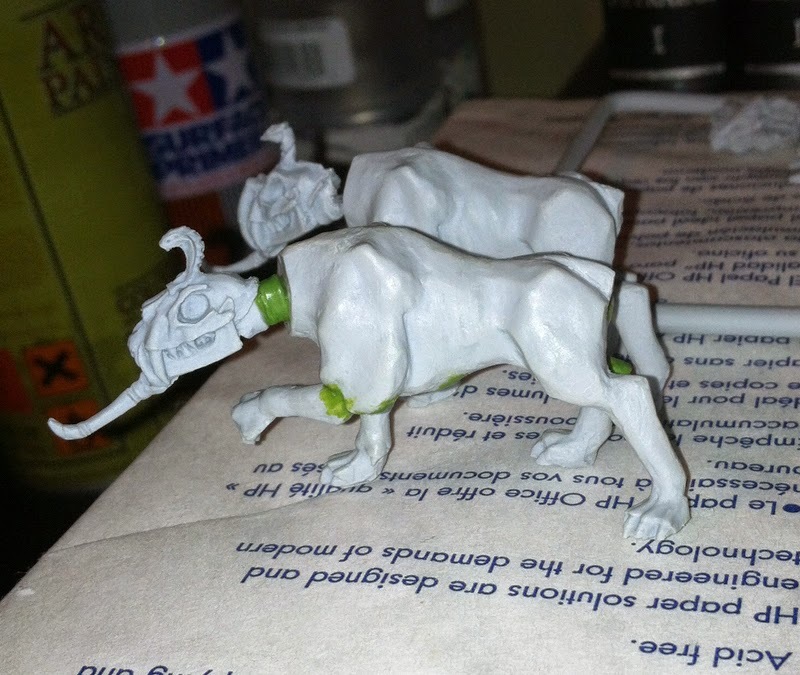 The last step I did before priming it was to figure out a way to attach the yoke to the constructs. I really wanted it to look like they were pulling the chariot and not just having the yoke floating above them like the standard Tomb King chariot. Using a piece of plastic tubing and some more green stuff I decided to make it look like it's attached directly to them instead of strapped on like it would be for a horse. I have started painting him finally since I only have about two month left until the Crystal Brush competition. 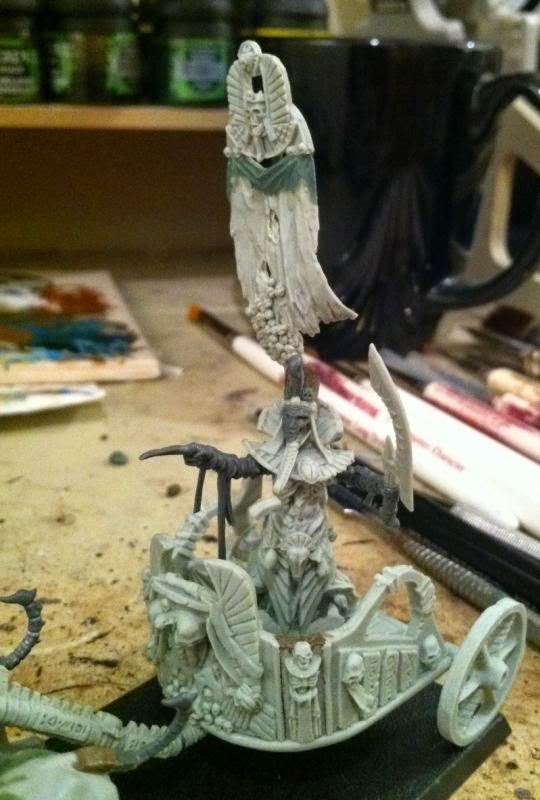 I primed the base with a bone primer, the constructs, king, and banner with black, and the chariot and wheels with grey. I chose each primer to compliment the majority color each part will be painted. This will hopefully make the whole process a little faster so I'm not working my mostly white, gold and blue chariot up from a black basecoat. In part two I will start going over my painting progress so far. There is a little sneak peak above and you can also follow me on Twitter where I post regular updates on it. If you have any questions about the build at all let me know in the comments and I'll make sure to answer them in a future post.